Brig. Gen. J. Marty Robinson (left), assistant adjutant general--Army (support), Missouri Army National Guard, shakes hands with Ret. 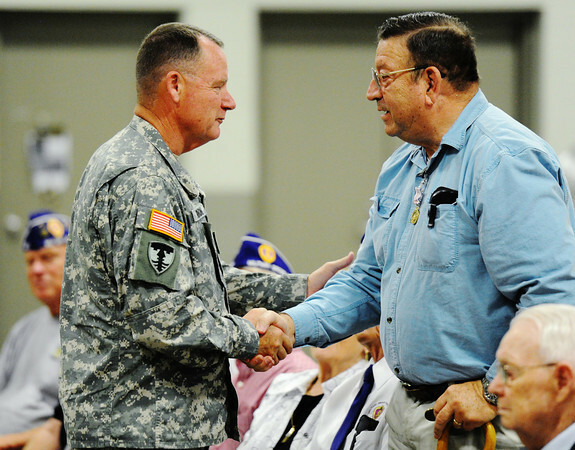 Maj. Paul Harvey Jr., who served in the U.S. Army during the Vietnam War, after presenting him with a medal during the Patriot's Day Veterans Award Ceremony Wednesday afternoon, Sept. 11, 2013, at the Missouri National Guard Armory on 32nd Street in Joplin. The event was sponsored by the MOAA Four State Chapter in cooperation with the Guard, the Missouri Veterans Association and the state of Missouri.